Welcome to Pat Anderson's ABC Music Notation pages! This is a website for musicians! If you play a musical instrument, you need tunes! If you haven't found ABC music notation yet, you are missing the best way to build and manage your collection of tunes! 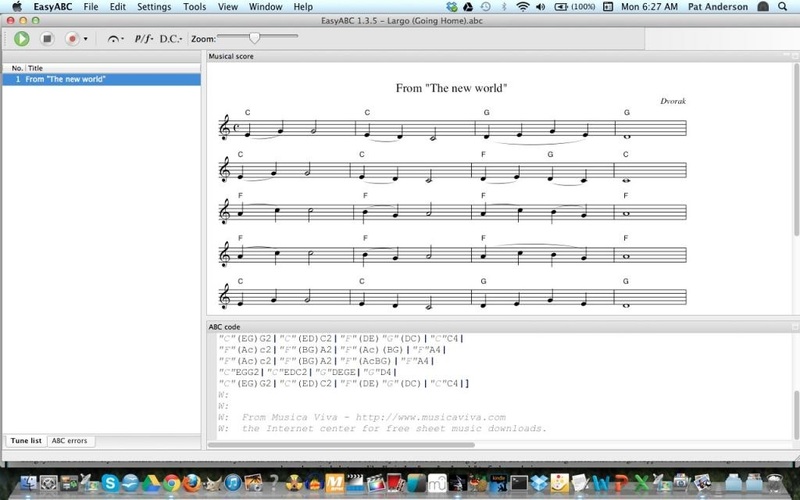 ABC is a versatile music notation standard that integrates extremely well with free computer software that unlocks the capabilities of ABC. There are thousands and thousands of tunes on the internet in ABC format. While maybe not the right tool for composing a symphony, ABC music notation and software allows you to easily grow and organize your personal collection of tunes! There is way more to ABC music notation than these pages contain, but everything you need to get started is here, in bite-sized pieces. The best way to get started is just to dive in! Read the tutorial page, download some ABC software and grab some tunes! Please be sure to introduce yourself in the Forum and post your favorite tunes! This is the place to post tunes, request tunes, and ask and answer questions about ABC!